[St. Louis, Missouri]: All Along Press, 2012. Edition of 70. 6.5 x 9.5"; Letterpress printed with Van Dijck types on Nideggen paper. Woodcut and photopolymer illustrations. Bound in hand-marbled paper over boards. Text by Don Welch. Illustration, design and printing by Elysia Mann. Numbered. 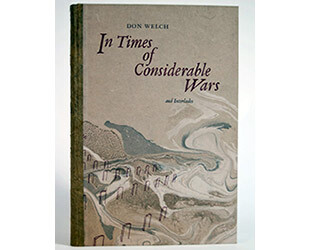 Elysia Mann: "Celebrated Nebraskan poet Don Welch pairs epic scope with intimacy in his collection of war poetry. With subjects ranging from the long-past battles of Troy and medieval England to the more recent conflicts in Bosnia and Afghanistan, he offers a sobering glimpse into the seemingly perpetual cycles of human violence. But interspersed throughout the timeline are the vignettes of loving conversations, spare and introspective, that offer a sense of unconquerable optimism. 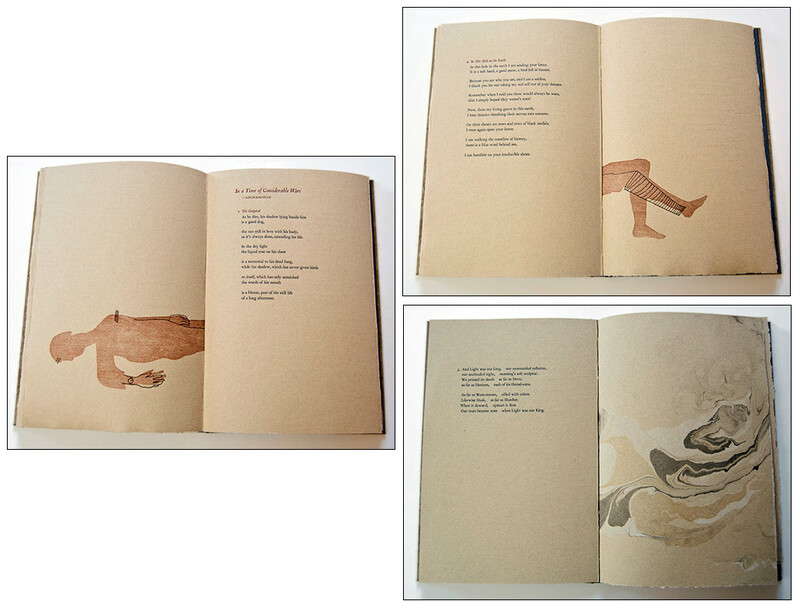 The gutter of the book severs and swallows illustrations, allowing them to reemerge as history-and the book itself-unfolds." 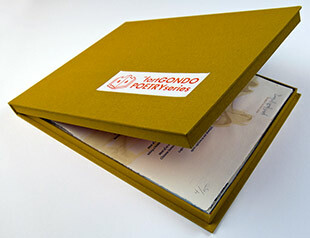 Winner of the Nebraska Book Award for cover/design/illustration book arts, 2013. [St. Louis, Missouri]: All Along Press, 2011-2013. Edition of 5. 10 x 13"; 30 unbound broadsides. Letterpress. Silkscreen. Relief. Monoprint. Printed on Hahnemühle Ingres and Zerkall Frankfurt papers. Laid in clamshell portfolio. Some numbered. Some signed. 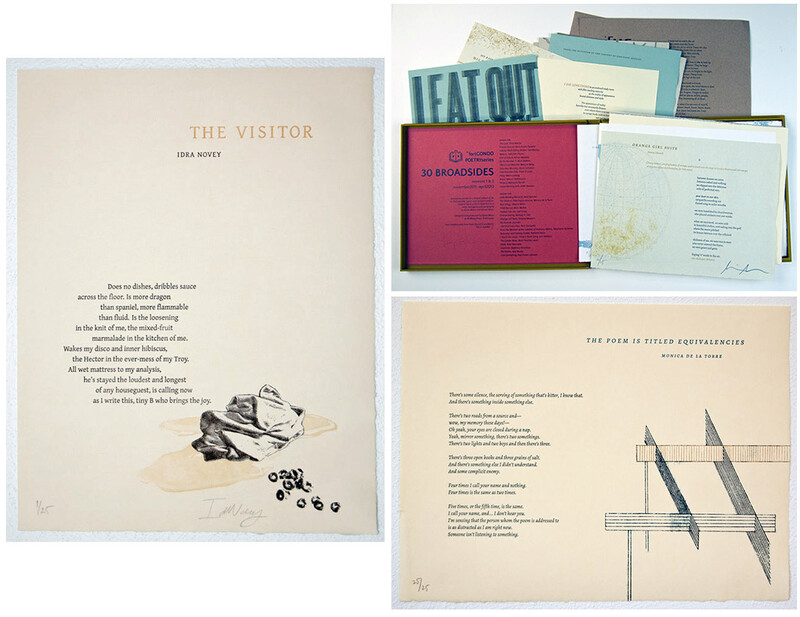 Collection of 30 broadsides produced in conjunction with readings in the Fort Gondo Poetry Series. Artwork by Elysia Mann and Steven Brien. Poets included: Chris Martin, Mary Austin Speaker, Ted Mathys, Sally Van Doren, Adrian Matejka, Mark Bibbins, Mary Jo Bang, Devin Johnston, Peter O'Leary, Marni Ludwig, Matvei Yankelevich, Nathaniel Farrell, Keith Newton, Buzz Spector, Mónica de la Torre, Wayne Miller, Marc McKee, Joel Craig, Melody S. Gee, Simone Muench, Joy Katz, Nick Dempske, Stephanie Schlaifer, Stefania Heim, Joni Wallace, Brett Fletcher Lauer, Aditi Machado, Matthew Henriksen, Idra Novey, and Paul Foster Johnson.